Phase Control Thyristor suits medium-power switching applications. Offered in long (20 mm), 3-lead, through-holeÂ TO-247 package, VS-50TPS12L-M3 is optimized for line rectification, soft start motor control, and temperature control in UPS units, welding equipment, power converters, industrial battery chargers, and SSRs. Glass passivation technology provides reliable operation toÂ +150Â°C junction temperature. Rated to 50 A and 1,200 V, RoHS-compliant and halogen-free product also carriesÂ 630 A surge current rating. MALVERN, Pa. – Vishay Intertechnology, Inc. (NYSE: VSH) today introduced a new 50 A, 1200 V phase control thyristor in the new long leads TO-247 package. For power switching applications, the Vishay Semiconductors VS-50TPS12L-M3 provides a new medium-power option in the 3-lead through-hole package. The thyristor released today is optimized for line rectification, soft start motor control, and temperature control in UPS units, welding equipment, power converters, industrial battery chargers, and solid-state relays. A rugged device, the single SCR VS-50TPS12L-M3 features a high surge current to 630 A, while its glass passivation technology provides reliable operation to a junction temperature of +150 °C. 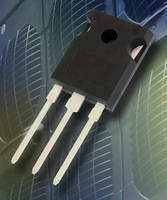 The RoHS-compliant, halogen-free thyristor offers long leads of 20 mm for flexibility in PCB mounting, while its high dV/dt of 1000 V/µS provides increased EMI immunity. Samples and production quantities of the VS-50TPS12L-M3 are available now, with lead times of five to 10 weeks for large orders. Pricing for U.S. delivery only starts at $1.10 per piece.